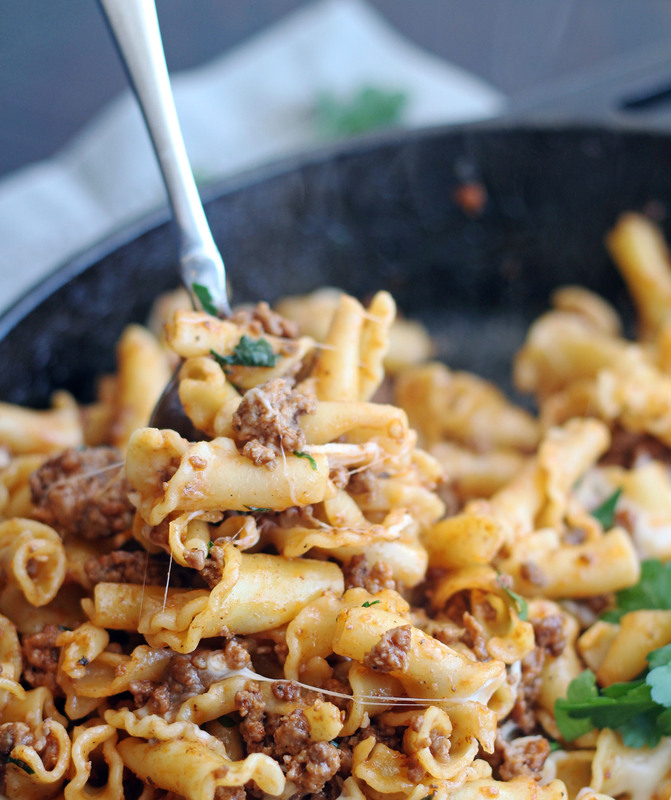 Fast, easy peasy, simple ingredients and incredibly delicious, this 25-Minute Skillet Meat & Cheese Pasta will become and instant favorite. This dish is true comfort food. 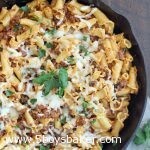 I love, love, love when I find recipes that are super fast, really simple to make and taste amazing, which I why I am loving this 25-Minute Skillet Meat & Cheese Pasta. I’ve professed before my entire family’s love of pasta. If I alternated between pasta one night and tacos the next, their lives would be completely satisfied, especially Parker’s. 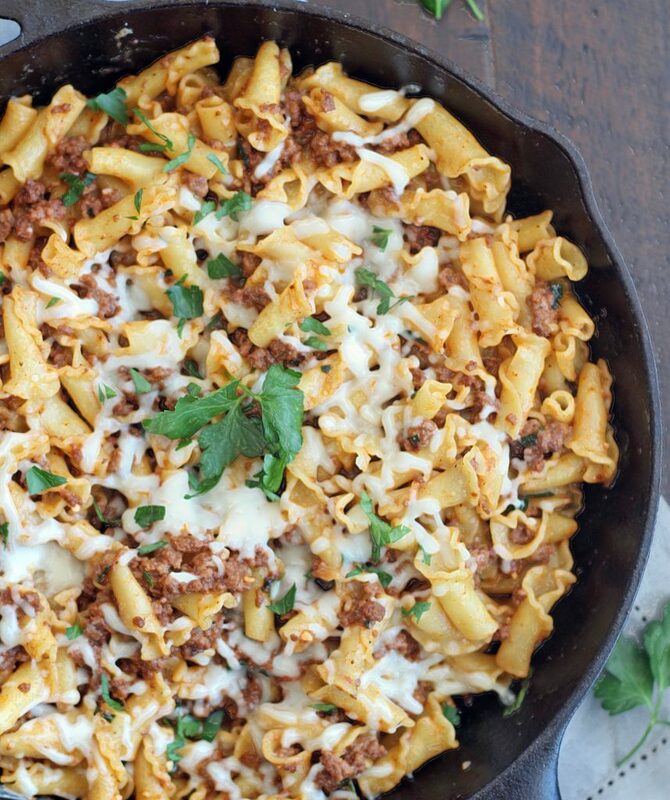 This Skillet Meat and Cheese Pasta was gobbled up in seconds the other night. There wasn’t a single bite left which made me sad because I wanted it for lunch the next day. It’s already on my menu again for this week because of it simplicity and deliciousness. Skillet dinners are my absolutely favorite, and while you do have to cook the pasta separately for this dinner and dirty a second pan, it’s totally worth it. 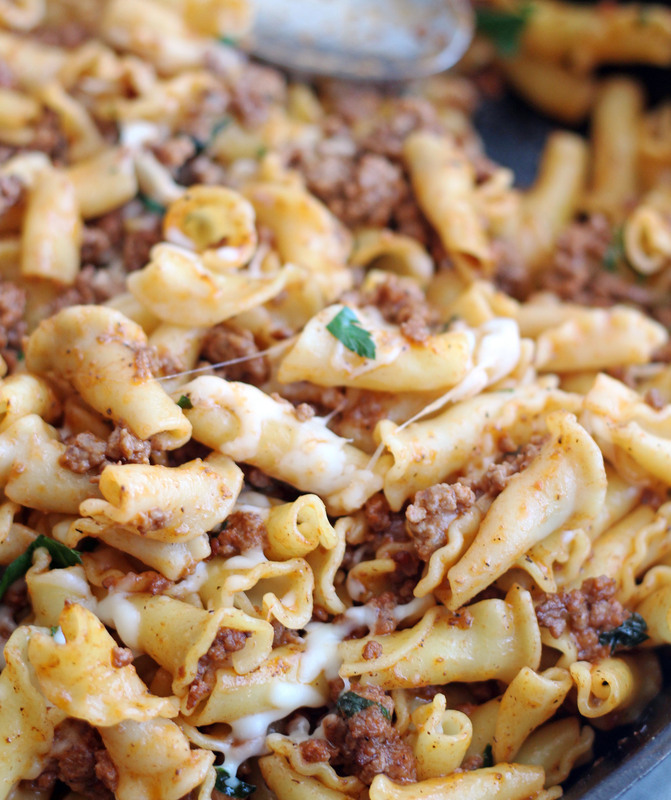 While the pasta is cooking you start your ground beef and in less than 30 minutes you will have this amazing, cheesy, completely fabulous dinner sitting in front of you. Serve this with a green salad and some breadsticks or french bread and you have a simple, fast and crazy delicious meal. What could be better? If you need something quick and delicious for dinner tonight, then look no further. Enjoy! The original recipe called for a full 1-pound box of pasta, but I only used about 3/4 of the box which I'm glad I did. If you're worried about it having too much kick from the red pepper flakes, you can start with less and add more if you'd like. I debated using the whole teaspoon, but I'm glad I did. It had the perfect amount of heat, just a little bit of a kick, but not too much. Bring a large pot of water to a boil and generously season with salt (about 1 tablespoon). Cook pasta according to al dente package directions less 1 minute. Reserve 1 cup pasta water. Drain pasta without rinsing. Meanwhile in a large skillet over high medium heat add 1 tablespoon olive oil and brown the ground beef, cook until no longer pink. Turn heat down to low and add 1 teaspoon salt and 1/2 teaspoon black pepper. Stir in garlic, onions, chili flakes, Worcestershire sauce, tomato paste, parsley, and 1/2 cup pasta water. Simmer until meat is tender, about 5 to 8 minutes. Toss in pasta and 1 cup mozzarella. Top with remaining cheese and cover with lid. Garnish with parsley and serve immediately. Hi Jodi – I’m curious about what pasta you used. It looks so good. Thanks! Hi Janie! I used campanelle pasta (Barilla brand), I love the fun shape of this pasta. 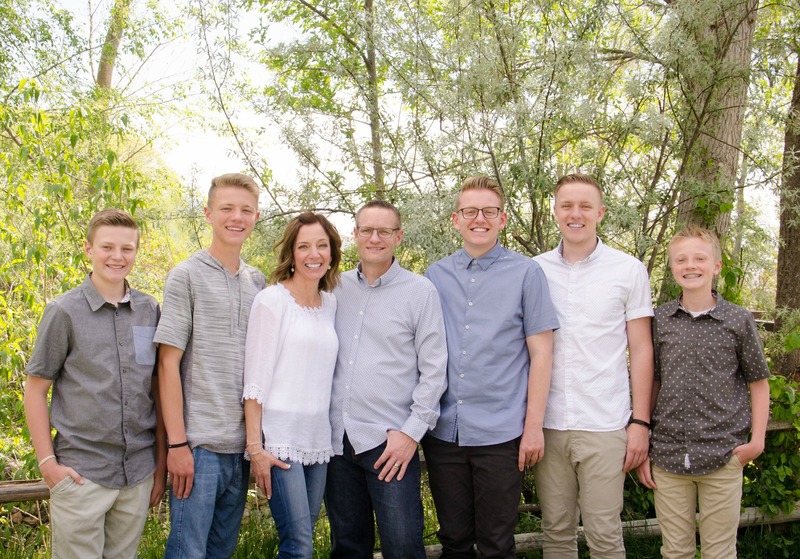 I hope you love this!